At the middle station of the cable Andalo - Doss Pelà, at an altitude of 1,480 meters, there is an extensive area with inflatables and games for sledding and having fun on the snow. The Park is assisted by a qualified staff that will entertain and play with all the children. In case of bad weather it's possible to access a room inside the Dosson shelter equipped with various games and activities. While the parents are skiing, the little ones can stay and play with the qualified assistants of the animation staff, having fun between inflatables and sledges! 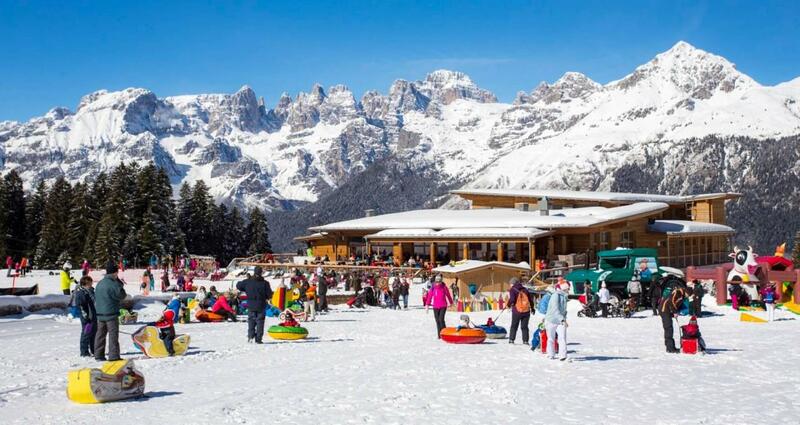 The Dosson Baby Park is part of the PAGANELLA KINDER CLUB circuit with the Biblioigloo and the Baby Roccia mini club - the daily ticket (€ 9.00 with card - € 11.00 in full) allows access to all 3 facilities of the circuit.